With the summer having arrived early in Greece this summer, JULIE M's crew is ready to embrace a busy season. BAVARIA YACHTS is set to surprise everyone at boot Düsseldorf with a new 45-foot sailing yacht from the C-line. Available for sale is the 25,2m. Azimut80 "memories" by First Quality Yachts. Boasting a crew of five and able to sleep up to 10 onboard, 29 metre yacht, Harmonya, is ideal for cruising the Mediterranean. 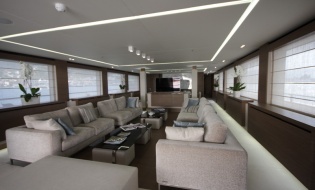 JULIE M, this excellently maintained 25m Ferretti loaded with toys and amenities, offers impeccable service by a crew of 5 who are having a remarkably successful season .